You know that you need to be on social media. But, you haven't found the answer for "What kind of social media should my business use!?!" Knowing which social media platforms to use to drive your business goals forward comes down to understanding 1) where your audience is at and 2) how much time you have to invest in social media. Do you already know that? Skip to 3 helpful tips for getting started with social media planning and management. Knowing where your audience is at is the biggest factor when deciding which social media platforms to invest in. 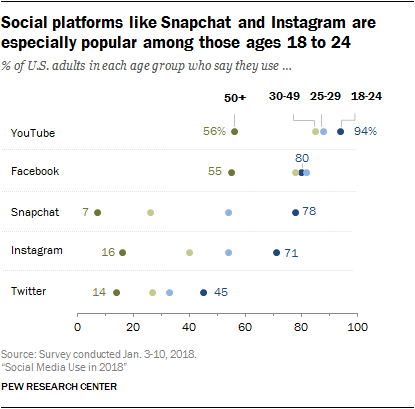 Let’s take a look at some social media demographic statistics gathered by PEW Research. What does this mean for you? Well you need to meet your target audience where they are at and curate content that will resonate with them. Instagram & Pinterest are for highly visual based industries, while Facebook & Twitter drive for interaction and feedback. If the industry is fast moving and very fad driven, Snapchat may be best for your business. If your business is craft-based or offers handmade goods where you regularly have new pieces of work, sharing on Pinterest would be a fitting option for you. I do not recommend trying to be present on every social media because, in this case, less is more. If you are spattering content without a true purpose it will not resonate with your intended audience. Our suggestion would be to pick 1 - 3 platforms to put your full focus on then re-evaluate over time to assure those same platforms are performing well. There is no “one size fits all” answer to the question, “How much time should you spend marketing on social media?” That is something that you need to determine for your business and based on your team’s workload. What we CAN tell you is the different facets of managing your social media, and how much time we recommend you dedicate to each facet. If you or someone on your team has more time to spend on social media, then consider taking the percentage approach when evaluating your time spent on social media. Once you concretely know how much time you and your team can spend on social media each week, pick the platforms of social media that your audience uses and invest in excelling at your presence on those specific platforms. There are different tasks you will need to keep up with when it comes to having a presence on social media. You cannot expect growth if you are not currating and publishing high quality, thoughtfully crafted content that your readers engage with. You cannot expect your engagement to exponentially skyrocket unless you engage with followers who engage on your posts (by liking their comments, replying to them, and continuing the conversation forward.) Beyond the content, keeping your brand appearance with the header, profile photo, descriptions, business hours and so forth up to date and relevant can drive new users to you. And when users want to reach out to you because you have done such a good job in each of the above areas, you need to answer. Have time blocked off on your schedule for responding to their private messages and responding to any reviews that come through. Remember, your content should not primarily tout sales-pitchy content. You want your content to be helpful to your target audience and your current followers. Once you have their trust because of providing resources for them, they will come to you looking for your products and services. Another tidbit to keep in mind when curating content is the Pareto Principle, aka the 80/20 Rule. What does this mean for social media? It means that 20% of the content should produce 80% of your results. This means devoting the time and care to target specific business driving goals on about 20% of your posts should, when effective, produce 80% of your sales from social media. You may be thinking that this all sounds great in theory, but you may still have no idea of where to begin or how to make your current social media better. Start by developing monthly themes, dedicating time to getting ahead, and delegating to your entire team. Take a moment and determine some pain points, points of question, and unique interests that your target audience shares. Your business may cater to parents with young children whose pain points may be living up to societal parenting expectations. As a result, they will have questions about how to take care of the aliens that have come to dwell in their home, and they would be interested in “life hacks” to make their days more manageable. From these pain points, questions, and interests, develop a list of themes that you can fit different types of content into (shared articles, in-house related content and resources, videos, a moderate number of motivational quotes or interesting facts, etc.). Dedicate time to getting ahead! From personal experience I can assure you that one of the best feelings when it comes to social media content creation is getting a whole month of content planned and scheduled BEFORE the month has already been flipped on the calendar. (We use CoSchedule for post scheduling and it’s amazingly awesome. There are also other third party posting platforms like Hootsuite and Later.com that may be better for you.) You might be surprised by the amount of time saved in total by getting a whole month of content created and scheduled in a dedicated time slot - give it a try, I dare you. Do you crave more more advice for managing your small business’s social media?